Home » Blog » general dental » Do You Have Sensitive Teeth? Has ice cream ever made you scream? Have you ever been stunned by the first sip at Starbucks? 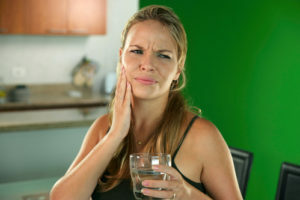 If you experience pain and discomfort while eating food and drinking beverages that are too hot, cold, sweet or sour, if brushing and flossing your teeth has become a painful process or breathing in cold air hurts all of a sudden, then it is highly likely that you have the case of sensitive teeth. Some people are born with sensitive teeth, but in many cases, the problem manifests from one or more of the following reasons. Brushing your teeth frequently or roughly may damage its natural enamel or irritate your gum line, causing it to move away and exposing the sensitive roots of your teeth. If you have a crack or chip in your tooth then you may expose yourself to bacteria from plaque, causing the nerve ache to intensify. Some of you may notice over time that you have started grinding or clamping your teeth, which leads to erosion. Many people unknowingly do this while they are asleep due to stress and anxiety. This generally leads to gum decay and eventually breaks down the enamel. It can also lead to an infection that will attack your tooth’s roots and cause long-term damage. Using products that contain baking soda can seriously worsen the exposed roots. You need to remember there is always a better way. As your El Monte Dentist, we can assist and educate you on how to keep your teeth clean and shiny without the use of harmful substances. How to Prevent Your Teeth from Becoming Sensitive? It isn’t that tooth sensitivity isn’t treatable, but you still need to remember a few tips and take advantage of them at home. You can use desensitizing toothpaste that contains chemicals to prevent hot and cold sensations reaching the nerves of your teeth. Use a soft-bristled toothbrush as additional pressure on teeth that are already sensitive can make the problem worse. Avoid using heavy chemical mouthwashes and stick to a simple fluoride mouthwash. Try to avoid eating and drinking acidic foods and beverages such as tea and citrus fruits. Most importantly, maintain a good oral hygiene by brushing twice a day and flossing. There is no reason as to why you can’t prevent your teeth from becoming sensitive. Be cautious and take care of your teeth as you would with anything else. As your trusted El Monte Dentist, we provide you different types of treatments to minimize sensitivity. These include applying desensitizing agents such as fluoride varnishes, fluoride gels and foams, and pastes. These products seal the openings and prevent bacteria formation in unreachable places. These treatments also normalize the enamel of your teeth. Sensitive teeth can be a painful issue, but with good oral care and caution, it is certainly preventable. Talk to us to learn more about managing your sensitive teeth.